TSTV Sassy Decoder has been trending on the internet again since the announcement by the Nigerian Telecom Firm. A lot of reaction has been seen from the public, some are actually expecting while some think it might be a failed promise as usual. And since April 1st, 2018 is the sales date, they think it might be April fool stuff. Nevertheless, everyone needs to sit back and see how it goes since April is around the corner. While awaiting April, I think I should let you know this 10 facts about the said TSTV Sassy Decoder. 1. TSTV Sassy Decoder sales date is set for April 1st, 2018. 2. TSTV Sassy decoder including a dish and remote will be sold for ₦3500. 3. The sassy decoder has up to 70+ Channel. 4. It is embedded with the Pause subscription feature. 5. Subscription can be paused for only seven days. 6. Pause Subscription is only available in a monthly subscription plan. 7. The Sassy decoder has the PVR Function to record videos and play later. 8. 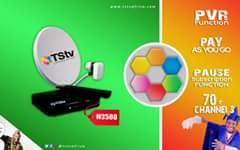 TSTV daily subscription fee cost ₦200, 3 days subscription cost ₦500 while weekly subscription cost ₦750. 9. TSTV Sassy Decoder subscription can be paid for using Quickteller. 10. TSTV Sassy decoder is not internet enabled. With these features, one can see that TSTV Sassy Decoder is the downgraded version of the old TSTV decoder that was to be launched last year. Like I said, let's sit back and see how things will go.